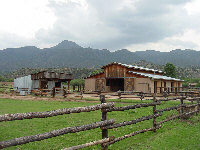 The Rockin' River Ranch is located in Yavapai County in central Arizona near Camp Verde. 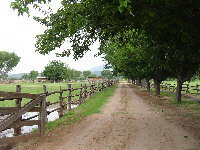 Camp Verde is centrally located approximately ninety miles north of Phoenix, the State Capital. Communities within an hour drive include Sedona/Oak Creek, which is 30 miles north of Camp Verde, Flagstaff, which is 50 miles north, and Prescott, the Yavapai County Seat, which is approximately 40 miles west of Camp Verde. 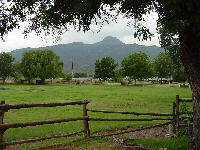 The Ranch is located along the Verde River near the base of Squaw Peak. 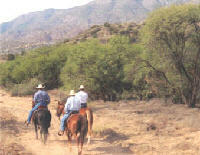 The Rockin' River Ranch is a horse ranch and retreat along the southwest banks of the Verde River. 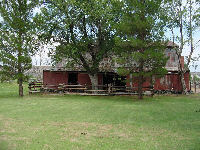 The property is currently operating as a horse ranch and recreational retreat. The deeded land consists of approximately 54 acres of flood-irrigated fields that have been divided into six pastures. 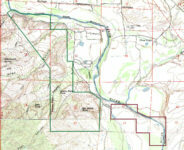 The balance of the property is utilized for building sites, riparian/river and open rangeland. The buildings include a large main dwelling/lodge, a small two bedroom/2 bath dwelling, a managers dwelling, a bunkhouse, two horse barns, a tack room, a storage building and a shop. There is also a new building under construction that will include an office, a studio apartment, exercise room, laundry facility, public restrooms (handicapped equipped) and two apartments. Also included is a large lighted roping arena with announcer's stand, shipping corrals, a round pen and a hot walker. The grounds are beautifully landscaped with large grass areas with pine and cottonwood trees as well as abundant riparian and other natural desert vegetation. The Verde Valley has a semiarid climate with the majority of rainfall occurring during July and August. Rainfall averages approximately 12 inches annually. Summers are characterized by warm days and cool nights. During July and August, temperatures often range from the low sixties in the mornings to afternoon temperatures in the upper nineties. The winters are characterized by mild days, often rising to the high fifties or low sixties in the early afternoon. Winter nights can be cold, with early morning minimum temperatures typically in the low thirties. Approximately 2,915 sq. ft. including a 576 sq. ft. Arizona room. Two story. Six bedrooms, four baths (one handicapped). Concrete foundation and floor, concrete block and wood frame construction with stucco, composition shingle roof. This dwelling has been completely remodeled for a bed and breakfast. All of the bedrooms have French doors to either a deck or patio. The floors are hardwood or slate. There are commercial stainless steel appliances, three hot water heaters, a soft water and reverse osmosis system. It has central air conditioning and heating and a 400 amp electrical service. There is a fireplace in the living room and an antique wood burning stove in the Arizona room. There are three large decks on the upper level and a patio surrounding the house on the lower level with three covered areas. Approximately 1,350 sq. ft. Two bedrooms, two baths. Concrete pillar foundation, wood floor, frame with barn wood board siding, corrugated metal roof. Covered 8'x 48' porch with wood floor, juniper posts and corrugated metal roof. Covered porch 6'x 31' with brick floor, juniper posts and corrugated metal roof. Antique wood stove, central heating and air conditioning as well as evaporative cooling. Wireless Internet equipped. A new two story building currently under construction. The first floor will include an office area, a laundry room, an exercise room a studio apartment and two public restrooms. The second floor will consist of two one-bedroom apartments. Office is wireless Internet equipped. Approximately 1,530 sq. ft. Three bedrooms, two baths. Concrete foundation and floor. Frame and adobe construction with plaster exterior and corrugated metal roof. River rock fireplace. Approx. 672 sq. ft. of covered porches with river rock borders, juniper posts and corrugated metal roofs. 17'x 24' carport with corrugated metal roof. Evaporative cooling. Approximately 672 sq. ft. Two bedrooms, one bath. Concrete foundation and floor, frame construction with plaster exterior. Wood stove with river rock base and wall, corrugated metal roof. Covered 8'x 48' porch with juniper posts and river rock floor, corrugated metal roof. Evaporative cooling. Approximately 2640 sq. ft. Concrete foundation with dirt floor, concrete block construction with plaster exterior, corrugated metal roof. Four oversized stalls with turnouts on each side of the center breezeway. Adjacent to the horse barn is a new tack shed an feed storage room. Approximately 4,140 sq. ft. Native stone and concrete foundation with dirt floor. Wood pole and frame construction with corrugated metal siding and roof. Six stalls and covered poultry coop. Approximately 1968 sq. ft. with 15' attached shed roof each side. Open siding with pole frame, dirt floor and corrugated metal roof. Approximately 263 sq. ft. 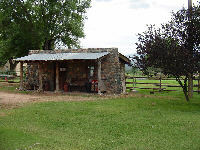 Concrete foundation, flagstone floor, river rock construction, corrugated metal roof, covered 7'x 21' porch with juniper posts, concrete-river rock floor and corrugated metal roof. Approximately 2,462 sq. ft. of which 782 sq. ft. is enclosed with a bathroom, with the balance open front on dirt floor. Pole and wood frame construction with corrugated metal backside and roof. 5'x 60' enclosed storage on concrete pad at back. Enclosed portion: concrete foundation and floor, wood frame and siding with 12'x 23' loft. Approximately 600 sq. ft. Concrete foundation and concrete/dirt floor, 2' rock base, balance wood frame and siding, plaster interior, corrugated metal roof. Attached 25' x 30' woven wire and wood pole frame pen with partition. Approximately 140 ft. x 260 ft. overall, with 12 ft. wide lane on one side. Constructed of V mesh wire on 2" x 6" lumber and wood posts with 2" x 6" kick board and cap rail. Two 40 ft. x 80 ft. holding pens. Chutes and boxes constructed of 2" x 6" lumber on wood posts. Wood gates. Approximately 182 sq. ft. announcer's elevated scoring booth with wood frame and siding with corrugated metal roof on wood poles. 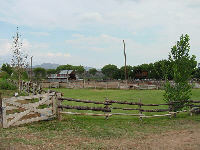 The property also has a large set of working pens, horse pens adjacent to the main barn, a round pen, and a hot walker. The Rockin' River Ranch site improvements include extensive wood rail fencing around all of the pastures, electric tape in the dedicated horse pastures, concrete irrigation ditches, a large irrigation reservoir that is stocked for fishing, a commercial outdoor kitchen and barbecue area with fireplace and smoker, extensive landscaping, fuel storage area and tanks, and extensive electrical and lighting improvements throughout the property. The water system for the Ranch is provided by four wells with a submersible pumps with two large storage tanks with a total capacity of approximately 13,000 gallons. Two of the wells are also tied to the underground irrigation system in place on the thirty acres that could be sprinkle irrigated. 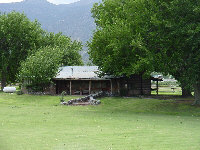 Electricity is provided by APS and Qwest provides Telephone service to the Ranch. Gas is provided by several propane tanks throughout the property and is delivered by private companies. Sewer service is provided by septic tanks and domestic water is provided by the private wells on the Ranch. Wireless Internet service is provided by Commspeed. Elementary and high schools are located in Camp Verde. School bus service is provided along Salt Mine Road at the Ranches entrance. The Rockin' River Ranch is an extremely rare find in Arizona. There are very few large horse properties left in the Verde Valley and with over a mile of frontage on the Verde River this property is truly unique. The location is ideal. It is just over an hour from north Phoenix and Scottsdale and thirty minutes from the red rocks of Sedona. The scenic setting offers privacy as well as access to some of Arizona's spectacular wilderness areas and historical sites. This is an exquisite horse ranch and retreat that potentially could be utilized for a bed and breakfast and commercial horse boarding facility or it would make a beautiful year round home. These assets make the Rockin' River Ranch a great investment opportunity. Please click here to download (about 1.1 MB) a printable brochure in Adobe Acrobat format. If you get frustrated trying to make this work on your computer, don't hesitate to ask us to mail you a printed and bound brochure instead.